On the night of the 29th of March, CIC organises our first event to celebrate and create awareness for the importance of diversity, equity and inclusivity. The theme for this session is women in innovation. You’ll be able to have an authentic movie experience in the most classical cinema of Rotterdam, Kriterion! And by the way a soda and popcorn are included with every admission. The renowned French sociologist Fabien Truong will give a lecture on the troubled French banlieues and the methods employed to resolve these issues. What can Rotterdam learn from this approach? Are you an entrepreneur in the areas of offshore wind energy, life sciences or automotive/mobility? Are you looking for opportunities to expand your business to the USA & Canada? Then join the Business Week USA & Canada on the 29th of November in CIC, Groothandelsgebouw in Rotterdam. You will have the chance to talk 1-on-1 to the experts within the American and Canadian market about the chances and opportunities of expanding to the American and Canadian market. Next to the 1-on-1 sessions, we will organize a plenary session where we will highlight the dos and don’ts, the possible opportunities and the support for entrepreneurs that you can tap into to expand your business. Following the plenary session, there will be three workshops. Each workshop will be set-up to tackle the specific business that you are in. Together with experts within the American and Canadian market and entrepreneurs with experience in doing business in the USA & Canada, you will have the chance to dive deeper and discover best- and worst practices that are specifically for your business. 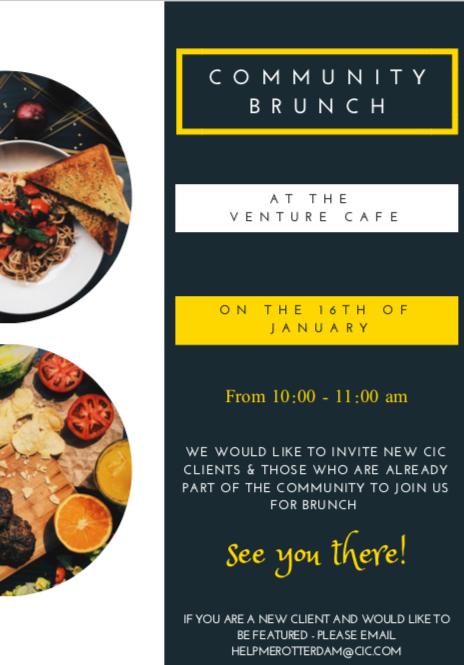 Finally, we will have networking drinks at the Venture Cafe in CIC. Would you like to join our program? Research is continuing to build and show that diversity is essential in all situations to create an inclusive culture that allows for growth, empowerment and business effectiveness. How do we make sure this drive for diversity is being taken up at all levels and in all industries. We invite you to come and hear from two ladies who are paving the way for progress. Speakers; Our speakers are Jacqueline Prins (from the Department of Education) and Jessica Haagmans (Regional Director Benelux at A+E Networks UK) who both have had an interesting and yet very different career. They will give insight into their experiences of diversity in the workplace. More information on our speakers will follow! Before, in between, and after the keynotes there will be great moments to connect to each other, exchange ideas, discuss and support challenges in business. Drinks and small bites are included.